Rookie real estate agent William Ritter learned quickly from friends and clients that many people find real estate agents on Facebook or Twitter plain annoying. Many agents post about open houses and tweet bone-dry real estate stories, churning out promotional content that lacks even a shred of interest to non-buyers or -sellers, said Ritter, a 2008 graduate of the University of Southern Indiana and Realtor at F.C. Tucker EMGE. “They usually defriended those agents that only post things that are business-related,” he said, speaking of people he knows who once followed real estate agents on social media. To cultivate a following of people who actually enjoy being connected to him on social media, Ritter turned to memes. Memes — ideas and concepts that often spread virally because they are compelling or humorous — resonate with millennials in particular, he said. About.com defines a meme as a “virally transmitted cultural symbol or social idea.” Memes may manifest as images or other media. The “Harlem Shake” meme, which some real estate agents seized on, was a video meme, for example. Mining sites like Reddit and Know Your Meme, Ritter finds image memes, modifies them to create real estate-themed versions, and tweets them and posts them on Facebook. 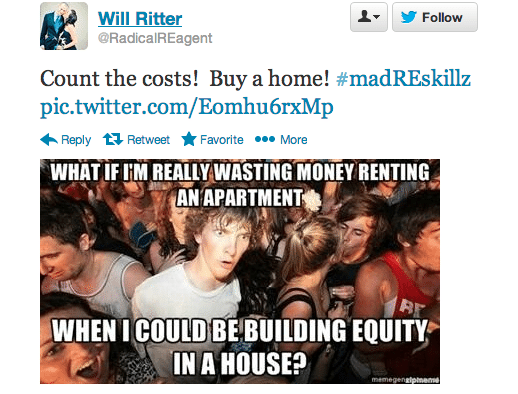 Image memes feature an image with humorous text that netizens like Ritter repeatedly modify. Ritter designs these images in a matter of seconds using the site Meme Generator, which allows users to search for memes and type in text to produce new iterations of the images. “All you have to do is find the picture you like, understand what the meme is doing and just type in some text, and it’ll put it on the picture where it needs to go,” he said. Not all of his co-workers think the images he designs are funny or useful, he said. But Ritter said that he believes using memes helps him connect with a market of buyers who skew young. They can help him “be that guy they can relate to, that they can joke with,” he said. Do you think memes are a creative way to connect with clients?